East Texas Events, Coupons, Reviews! Have you ever gone to clean out your car and dreaded moving the kiddos carseat because you fear what will lie beneath it?? yea me too. 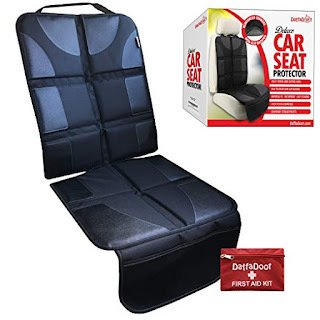 So recently I was asked to try out a product from Daffadoot, however I was forced to move my sons car seat in order to try it out, Man was it a nightmare. So what I got to try was a Seat Protector and I just have to say I am pretty impressed! this thick and heavy duty seat protector is sure to protect your seats from any damage your kiddo might bring. It works with not only car seats but just as a general seat protector! Now there is much to protect my car from because well its a pre owned 12 year old car, however for those of you that do have seats worth protecting! It is sure to be worth every penny! It has a strap that can wrap around a head rest, it is latch anchor compatible. It is heat tolerated, color fast, and non skid material! This seat protector came neatly packaged and even came with the little first aid kit pictured here. You know it is funny, when I was pregnant and creating a registry for the shower, I laughed at the idea of something like this.... now having tried it I do not laugh! This is a must have!